Pictured (l-r): Dickie Lee, Jim McBride, Pat Alger, Tim Nichols (all Nashville Songwriters Hall of Fame members) James I. Elliott (SNG Chair), and Drew Ramsey (SNG faculty). 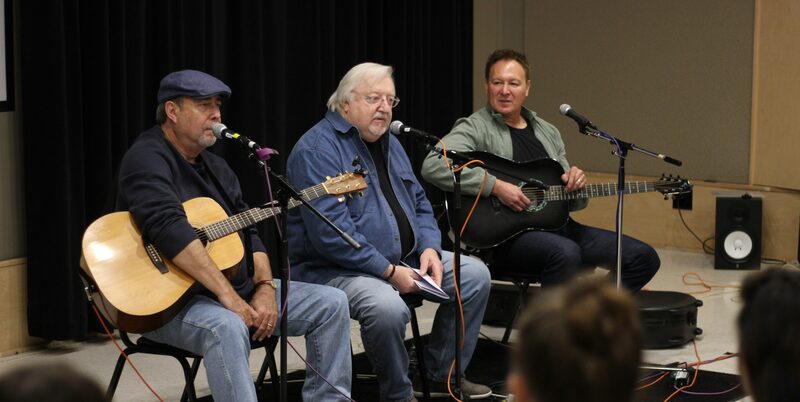 Hit songwriters Jim McBride and Tim Nichols were inducted into the Nashville Songwriters Hall of Fame this week, and then spent an evening sharing stories and songs two night later with Belmont songwriting students at an Oct. 25 event at Belmont’s Columbia Studio A on Music Row. Hall of Fame writer Pat Alger, a Belmont songwriting faculty member, moderated the event. Nichols has written “Heads Carolina, Tails California” (JoDee Messina), “I’ll Think of a Reason Later” (Lee Ann Womack) and “That’d Be Alright’ (Alan Jackson), but he may be best known for writing the 2005 hit “Live Like You Were Dying,” recorded by Tim McGraw. Nichols is also co-owner of publishing company This Music with Belmont alumnus Rusty Gaston, and the company publishes successful Belmont songwriting graduate Emily Weisband, who won a Grammy this year. The special seminar is one of many events this year as part of Belmont Songwriting’s 10th anniversary celebration. Student media outlet the Belmont Vision did a recap of the event which can be read here.